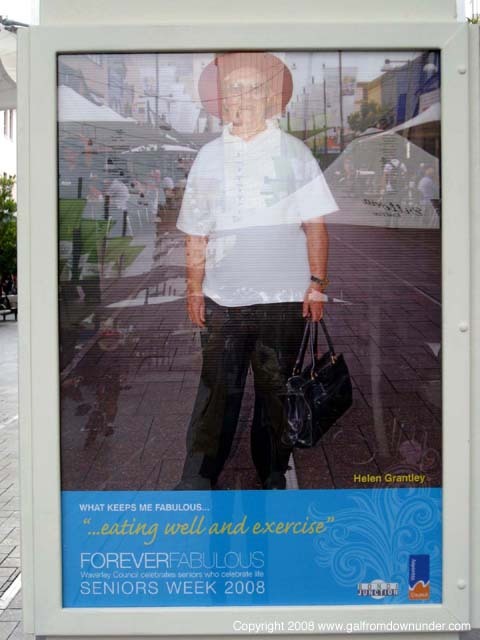 Spotted downunder during “Seniors Week”. I’m not advocating ramant political correctness here, which is just a poor excuse for counter stereotyping. I just don’t understand what a poster campaign like this is trying to achieve, other than bury people while they’re still blinking. Underthinking – It’s Seniors week … quick, let’s raid Best & Less for threads and a schlumpfy vinyl bag because that’s what seniors look like. Patronizing – Seniors can’t afford to look stylish or impressive on their pensions. And if we depart too much from our beloved stereotype the poor old fogies won’t get it. We better not be funny either, because they might not get it. The last movie they saw was “Gone With the Wind” and “Grumpy Old Men”. Lazy – let’s use trite and hollow phrases like “What keeps me fabulous” even though most seniors facing normal issues of aging would probably describe their feelings otherwise, if only you’d stop to listen to them. Fearful – we better not put someone who looks genuinely “fabulous” because it might miss our target. It gets worse. I switched on the teev and surfed across an elderly couple featured on “Grey Nomad Adventures,” showing them being taught to DJ at a night club. The youthful hosts made all the usual patronizing jokes about the couple’s music selection being Englebert Humperdink, about the danger (not) of groupies whisking away the hubby, about whether they were able to “get the beat” or did they keep lapsing into Viennese Waltz breakbeat, and so forth. The nice enough couple were obliged to play right along for the benefit of the cliché. Frankly, the hipper-than-thou hosts made themselves look the bigger, duller, drearier cliché. I’ve always wondered … where are the nightclubs for older people? Does Tina Turner or Mick Jagger sit about with feet in a heated bootie watching Days of Our Lives just because they’ve trawled the planet slightly longer than their fans? As she heads towards 80, her tastes just get wider and more diverse. Why shouldn’t they? We continue to grow because that’s what cells do, even if they start making mistakes. If seniors become forgetful, they’re just forgetting stuff that just doesn’t matter anymore – like being petty. They’re and making room for new experiences. If only we’d all hold off toe-tagging them before they’re good and ready. So before you overthink or underthink your next interaction with a senior, be it in person, in an ad campaign or marketing your next reverse mortgage package (which, incidentally you should be marketing to single, childless adventurettes like me), put yourself in those white lace up sneakers and imagine how you’d like the world to treat you when you’re 64, 74, 84. There’s no off-ramp to avoid our senior years – and those years will be be shaped by how you are treating Generation W (anyone born before 1965) right now. The Galfromdownunder admits to doing a pole-dancing course with her 70-something mother. It was her mother’s idea. Gazooks!